Microsoft keeps striving to make their interface look more and more similar to its rival Mac OS X. 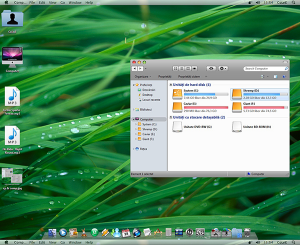 But regardless of how similar the UI becomes, it can never offer what Mac OS X can in one respect: real UNIX underneath. Yep, the fact that it’s not really UNIX underneath creeps in. Microsoft can only fix that by doing what Apple did in 2001, starting over with a UNIX-derived core. This was painful in many ways, but in the end, look at the turnaround of Apple prior to 2001 and since, where Apple’s brand awareness today has never been higher and market penetration is up ten-fold. and… usable UNIX underneath. You can argue whether it’s “real UNIX” or not, but it’s UNIX-enough such that most anything will work, including (again, free) seamless support for X11 apps. On a more minor note, Apple includes a lot more apps – yeah one can (usually) go find equivalent apps for Windows, download and install them – but it’s nice that Apple includes so many common apps with the machine, both GUI apps like iMovie and hundreds of UNIX command-line tools.